Buying your child their first set of golf clubs should be a memorable experience with a great range of sets available. Starting your kids early at the golf game is a good idea and getting them the best junior golf clubs will get them off to a great start. 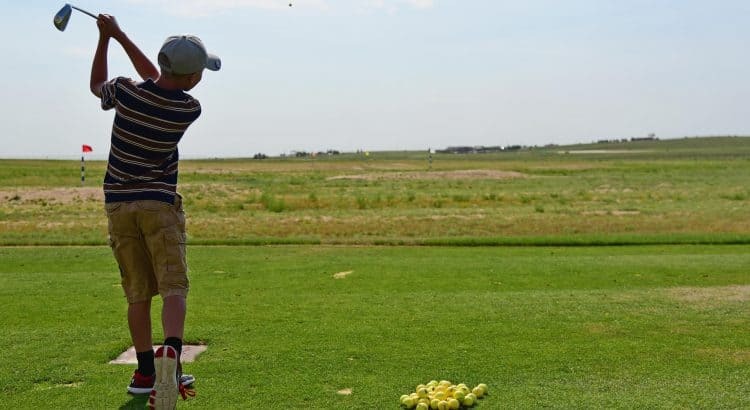 Budgeting the cost of a golf set for kids should be the first task as they vary greatly. The best junior kids golf club set as an all-rounder are the Callaway XJ Hot that has everything your child needs to play a round of golf. A junior golf club set usual ranges in sizes with the choice between 3 to 5, 5 to 8, and 9 to 12 years of age. Once they are over the age of 12, they can begin to move towards standard golf clubs. 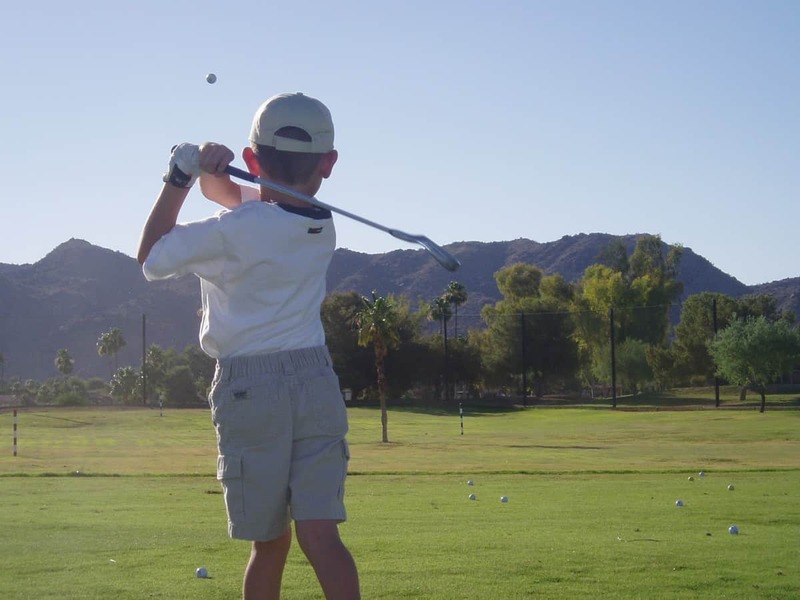 Children as young as 5 years of age can begin to play golf with great success. The junior golf club sets are smaller and lighter so that the young golfer can find it easier. It is tempted to buy your child a standard sized golf club set as they will “grow into it”. However, junior golf club sets are not as expensive as you would think with some starting from the cost of a standard size sand wedge. If you are looking for high end to cheap sets for your child, below is a list of the best golf clubs for juniors. The Callaway XJ Hot Junior Golf Club Set offers a driver, fairway wood, hybrid, 7 and 9 iron, sand wedge and a putter in the bag. These 7 clubs are ideal for a junior to get started learning the game with additional clubs by Callaway available if they wish to add more clubs to their bag. 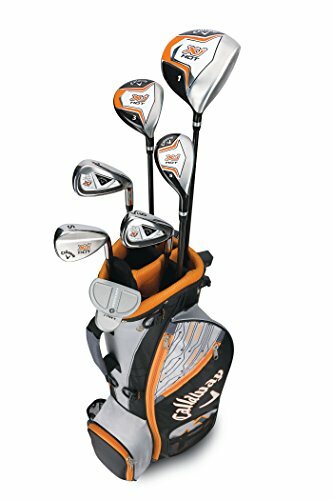 This junior golf club set is available for both left-hand golfers and right-hand golfers. You can also purchase the set for the ages of 5 to 8 or 9 to 12 with appropriate golf club lengths for each age group. In terms of the height of your child, for 5 to 8 years the height ranges from 40 to 52 inches whereas the 9 to 12-year group are ideal for children 52 inches and above. To build confidence, the Callaway XJ Hot golf clubs for juniors are built to be forgiving and for distance. Compared to other sets that are cheaply made and not focused on a golfer that is just starting off and won’t have as much power as an adult. There is no need to buy a high quality golf bag, the XJ Hot comes with its own lightweight golf stand bag with 5 zipped pockets, bottle holder and more. These junior golf clubs tick every single box and better yet they are a very reasonable price for such high quality. Callaway have really produced the best junior golf club set for the money that will get any child of to the best start of their golf career. Buying a set of clubs for your child that has never played golf before can be a risk and an expensive one at that. However, budget junior golf clubs can be bought without the drop in quality or missing clubs. Confidence are dominating the market for cheap golf club sets for juniors and for good reason. The golf club set for kids are available for both left hand and right hand orientation from the ages of 4 to 7 and 8 to 12. 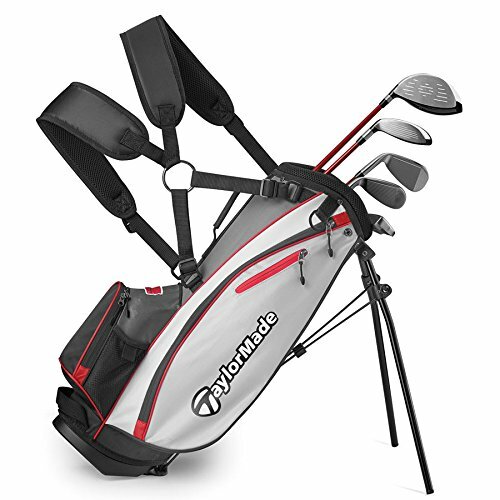 Included is the lightweight golf bag with the four way divider, four pockets and much more. The junior golf club set contains a driver, 3 wood, 7 and 9 iron and a putter. The woods have the additional loft to aid forgiveness to increase the confidence of the young golfer. 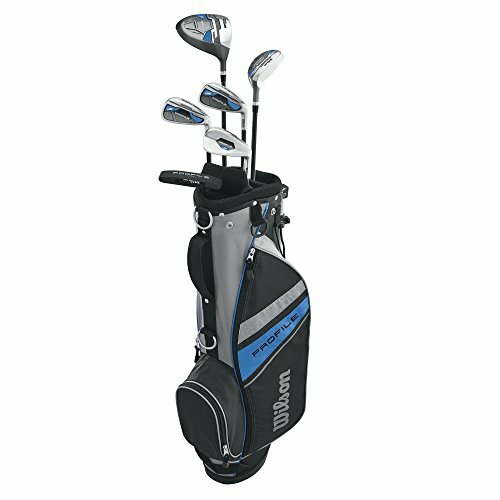 As this is a budget junior golf club set, it does not contain a sand wedge and the golfer will need to use the 9 iron for pitching. Overall, the junior will enjoy these and your bank account will not suffer. They are the best cheap junior golf clubs that are a great introductory set of clubs to begin with before upgrading to standard sized clubs. 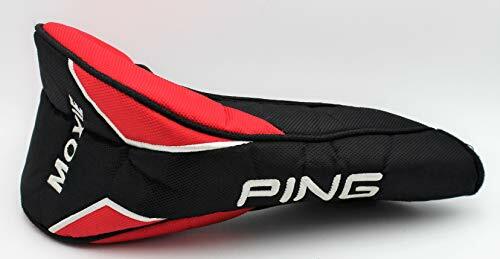 The Ping Moxie Junior Golf Club Set is a popular set produce by a major golfing brand with every club your child needs to get started. Available in both right and left hand orientation with sizes for 6 to 7, 8 to 9 and 10 to 11 year old kids. The Ping Moxie is the alternative to the Calaway XJ Hot set and includes a driver, fairway wood, 7 and 9 iron, sand wedge and putter. All the clubs (apart from the putter) are designed to improve forgiveness with a high degree of loft. For example, the driver has a 16 degree loft. If your child has grown out of their cheap junior golf club set, these would be an excellent upgrade with a range of sizes to choose from. With the reputable brand backing the clubs, you can rest assure that they are a high quality set that will last longer than cheaper alternatives. For a small amount more than the Confidence golf club set, you can buy the Wilson version that contains a dedicated wedge as well as a premium brand. 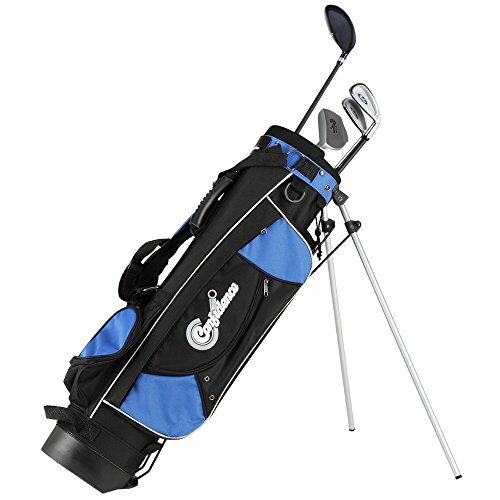 It is a 9 piece junior golf club set with a cheap price for youths that want to test their golfing abilities. The junior clubs are targeted for 11 to 14 year olds with a set for both left and right hand golfers. It contains a driver, hybrid, long iron, short iron, wedge and a putter, which is everything you need to get started playing golf. Overall, these budget junior golf clubs are the perfect cheap set to begin with. They will offer a high quality feel compared with the confidence set and includes a wedge but they are slightly more expensive. Moving towards the more premium junior golf clubs, we have the TaylorMade Phenom set that has been engineered to support young golfers to achieve excellent distance and accuracy. The clubs have larger club heads and additional loft to be very forgiving. The shafts are premium and made from a high quality steel for irons and graphite for the woods. The junior golf club set is available for both right and left handed golfers with the choice of 6 or 8 clubs to add to your bag. If you own a set of TaylorMade clubs as a parent, why not treat your child to their very own set? They are very cheap considering they are produced by such a premium brand and you can be sure they will last during the juniors golfing career. The TaylorMade Phenom is a great all rounder set for juniors looking for the extra edge to kicks things off. These clubs would have been tested by golfing professionals to ensure that they are forgiving and easy hitting. As an experienced golfer, you are more likely to buy clubs for certain reasons i.e. to gain distance driving or for forgiveness. However, if you are just starting out as a junior, you will need a full set of clubs straight away. To help you on your way, we have designed a buying guide to choose the correct clubs for your child without breaking the bank. The irons and woods usually take up a large bulk of the clubs in your golf bag. The longer irons are the hardest golf club to hit and not a club juniors should be using on a regular basis. The majority of juniors are more likely to get a kick from hitting the ball up a high with some distance. As the power and swing speed will be fairly low within a juniors golf swing, the distance between clubs will not be that noticeable. For that reason, you will want a driver, fairway wood, 2 or 3 irons, a wedge and a putter. This will be surplus requirements and you can always add to the junior clubs as power and swing speed improves. The majority of golf club sets for juniors are a sizable amount of money to invest as well as the equipment that comes with the golf game. Be sure that your child wants to play and has interest in golf with activities such as chipping the ball into target nets or something simple as fun putting greens. If they are interactive with these and want to get onto the course, it would be the perfect time to buy the best junior golf club set for them to use. Do not fall into the trap of “don’t worry you will grow into them”. All this will mean is that they will have a terrible time at a young age and not want to continue playing golf because they are struggling to hit the ball properly. Junior golf clubs are usually grouped by age groups from from the ages of 5 to 14 with sub categories such as 5 to 7 years of age. If your child is slightly taller, go up an age range for the best possible fit. From 14 years of age and above, the junior will probably be best of upgrading to a standard size golf club set. Of course, you will also need to factor in hand orientation. If your child is right handed, by right handed golf clubs and vice versa for left hand golfers. The majority of junior golf club sets will come with their own golf club bag as part of the package. However, you will also need to buy a high quality golf glove, some comfortable golf shoes for climbing hilly courses and appropriate golf balls for distance to build up their confidence. Of course, you can go even further with expensive accessories but before you do this, ensure your child is wanting to play golf for years to come. If you splash out a large quantity of money on a junior golf club set and in turns out that they don’t like golf, it can result in a costly mistake. However, on the flip side, you also want your child to have the best possible start by using high quality junior clubs dedicated for forgiveness and distance.